We are stayin' up sing we are stayin' up!! 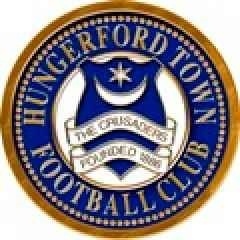 Hungerford Town secured another season in the national league south by edging out East Thurrock by one goal to nil. The visitors knew they had to match or better Poole Towns result to stay up. The Crusaders made a positive start when a succession of nicely worked corners came close to going in; however, they survived a scare when Reece Harris crossed for Lewis Smith and the striker put the ball past Marcus Beauchamp but the goal was ruled out for offside. Rhys Tyler then crossed for Nicholas Bignall but his header was well saved by home goalkeeper Lukas Lidakevicius. Hungerford finally found the crucial break through on 37 minutes when a Lewis Leigh-Gilchrist pass sent Bignall through on goal to sweep home past Lidkevicius low into the corner of the net. Louie Soares dragged a shot wide on the edge of the area before a crucial block denied home skipper Lee Burns in the box. The second half was a cagey affair and became a test of nerves as news of Poole beating Oxford City filtered through. Half chances for both sides came and went and the four added minutes seemed like an eternity as East Thurrock even threw their goalkeeper forward for two last minute corners. But the Hungerford players blocked everything thrown at them and The Crusaders clung on for a massive win and the final whistle sparked wild celebrations and a pitch invasion from the travelling fans.